The Valley Local: On the New Haven Railroad - 80 Years Ago Today . 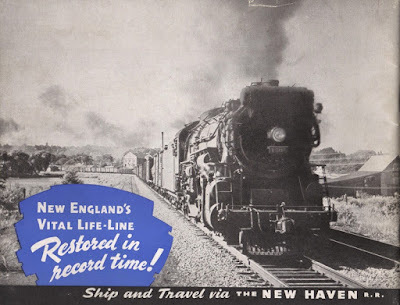 . .
On the New Haven Railroad - 80 Years Ago Today . 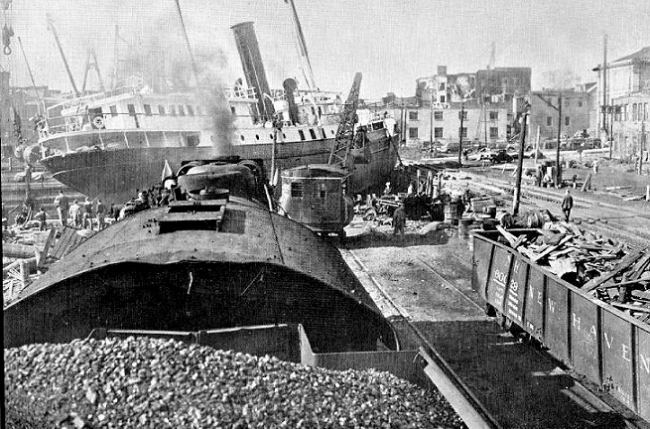 . .
Today marks a somber - and for the New Haven Railroad, a devastating - event that happened exactly 80 years ago. Making landfall on September 21, 1938, The Great New England Hurricane was - and remains - the most powerful and deadly to hit New England in at least 300 years. It killed an estimated 682 people, damaged or destroyed 57,000 homes and cost an estimated $4.7 billion in 2017 dollars. Even as late as 1951, you could still see damaged trees and buildings. 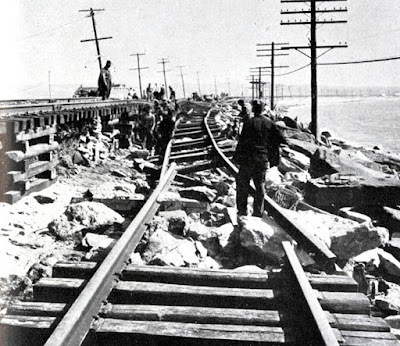 The New Haven's Shore Line route was hit especially hard. . .
"On September 21st, 1938, with flood waters already threatening major washouts at important points along the New Haven Railroad where the tracks paralleled or crossed the swollen torrents of New England's rivers...suddenly, just before dark, in the teeth of a howling southwest gale which increased momentarily to hurricane proportions, a steadily rising tide which in some places rose twenty feet in as many minutes, swept inland along the New England coast-line across the Shore Line Route of the New Haven Railroad...carrying on its crest hundreds of boats, ships, cottages, buildings, and wreckage. Communications by rail, wire, and telephone with many devastated areas was completely cut off. No one realized as yet what a staggering blow had been dealt by this combined hurricane - tidal wave - flood throughout the length and breadth of southern New England. But the next morning revealed a grim picture of death and desolation. Where fast freights and through passenger trains, including the crack Shore Line Limiteds had sped in rapid succession between New York and New England points carrying passengers, mail, express, and the vital necessities of life...now miles of silent track hung at crazy angles over yawning chasms in a hopeless tangle of power lines, signal towers, houses, boats, and thousands of tons of debris. Further inland at Hartford, Springfield, Norwich, Willimantic, and Putnam the hurricane had left its toll of felled trees and communication systems, crumbled freight sheds and roofless factories...and to add to the chaos, the raging rivers from the north broke through dams and temporary dikes, washing out railroad bridges and miles of track...rendering useless the strategic points through which Shore Line trains might have been re-routed. The vital life-line between New England and points south and west had been effectually severed. It had to be restored without delay. 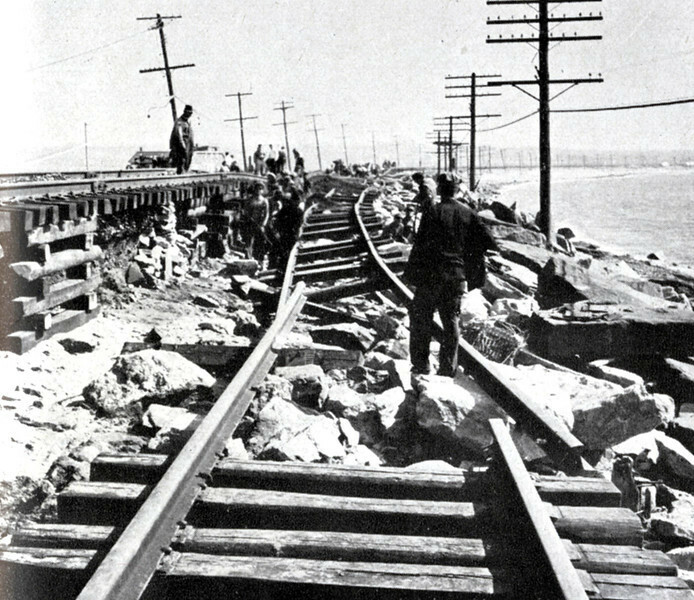 Thousands of men were needed for the Herculean task of rebuilding a railroad. 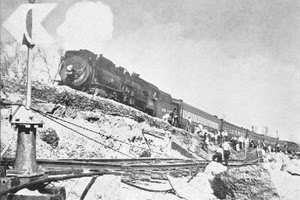 The summoning of trackmen, engineers, skilled repair crews, and laborers had to be carried out without the help of modern communications systems. In an incredibly short time an army of 5,000 men were at work...toiling 24 hours a day in 3 shifts...many of them eating and sleeping in work trains and Pullman cars on the job..."
For more photos, be sure to check out the NHRHTA's 60th Anniversary coverage here and for more detailed information on the hurricane itself, check out this site. Those of us living in New England a few years back went through "Superstorm Sandy" and got a taste of what The Great New England Hurricane might have been like. But, as it turns out, it was a pretty small taste - as bad as Sandy was, it didn't come anywhere close. Check out this site for an eye-opening comparison of the two storms. There are fewer and fewer folks that have first-hand memories of that fateful day 80 years ago, but thanks to the extensive coverage the storm received - not to mention the wonders of the internet that allow all that coverage to be easily saved and shared - the heroic efforts of the employees of the New Haven Railroad, including those on the Valley Line and most especially along the Shore Line, will never be forgotten.